Federal-Mogul Corporation (fdml:NASDAQ) has developed maintenance-free bearings for one of the world’s longest suspension bridges. Upon completion later this year, the Hardanger Fjord Bridge in southwest Norway will be one of the largest in the world, spanning 1,310 meters (4,297ft) between pylons. A total of 128 spherical plain bearings using Federal-Mogul’s DEVA self-lubricating material technology will accommodate the small but essential movements that occur between the bridge and its supporting cables. Conventional roller bearings were not well-suited for the prolonged, minute movements of the bridge while under constant heavy load and could potentially suffer from surface failures called ‘brinelling.’ Federal-Mogul’s thin-walled, self-lubricating sliding material, deva.bm, addresses this issue by providing a larger load-carrying surface, providing sufficient durability for the life of the bridge without repair or replacement. The design of each bearing installation ensures that even if the sliding layer became damaged by exposure to loads in excess of the design values, the structure of the joint is protected and the plain bearing would function at a reduced level. The complete bridge includes 120 spherical plain bearings with a shaft diameter of 160 mm and eight with a shaft diameter of 300 mm, used for the main retaining cables adjacent to the two bridge towers. The bearing solutions for these exceptionally challenging requirements was developed by Federal-Mogul DEVA GmbH, based in Stadtallendorf, Germany, where engineers used a combination of materials from DEVA’s standard, well-proven product range. The joint balls are made from stainless steel, which is pressed into a plain bearing made from deva.bm. A low-friction sliding bearing consists of a backing comprised of steel, stainless steel or bronze, with a deva.metal surface layer. This surface layer is a bronze material manufactured using powder metallurgy – it is not porous and oil-impregnated, but rather highly compressed and coated with a layer of solid lubricant material, such as graphite or PTFE. The bearing housing forms a two-part spherical ring, also lined with deva.bm, to provide an extended, maintenance-free service life, high static and dynamic load capacity, and low friction properties resulting from layers of homogeneous solid lubricants. The design is completed using thrust washers that are also made from deva.metal, which absorb axial forces. 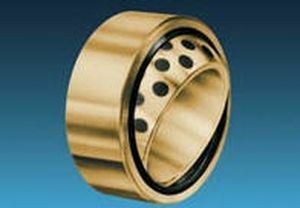 The bearings are ideal for dry running at slow sliding speeds with very high resistance and are well-suited for extreme temperatures and corrosion. This is not the first time that DEVA plain bearings have provided reliable, low-maintenance solutions for bridge construction projects. A number of bridges around the world benefit from this Federal-Mogul technology, including the flap bridge in the port of Valencia, Spain over which the Formula 1 race circuit passes; the bridge over the Peene near Anklam, Germany; and the Rethe Bridge in Hamburg, Germany. Federal-Mogul Corporation FDML +2.81% is a leading global supplier of products and services to the world’s manufacturers and servicers of vehicles and equipment in the automotive, light, medium and heavy-duty commercial, marine, rail, aerospace, power generation and industrial markets. The company’s products and services enable improved fuel economy, reduced emissions and enhanced vehicle safety. Federal-Mogul operates two independent business segments, each with a chief executive officer reporting to Federal-Mogul’s Board of Directors. Federal-Mogul’s Powertrain Segment designs and manufactures original equipment powertrain components and systems protection products for automotive, heavy-duty, industrial and transport applications. Federal-Mogul’s Vehicle Component Solutions Segment sells and distributes a broad portfolio of products through more than 20 of the world’s most recognized brands in the global vehicle aftermarket, while also serving original equipment vehicle manufacturers with products including braking, chassis, wipers and other vehicle components. The company’s aftermarket brands include ANCO wiper blades; Champion spark plugs, wipers and filters; AE, Fel-Pro, FP Diesel Goetze, Glyco, Nural, Payen and Sealed Power engine products; MOOG steering and suspension parts; and Ferodo and Wagner brake products. Federal-Mogul was founded in Detroit in 1899. The company employs 45,000 people in 34 countries, and its worldwide headquarters is in Southfield, Michigan, United States. For more information, please visit www.federalmogul.com .